The new Quadrocopter revolution has now reached KHO. These flying platforms are ideal for remote sensing due to their stable attitude. Our aim is to fly our hyperspectral imagers using these Quadrocopters. 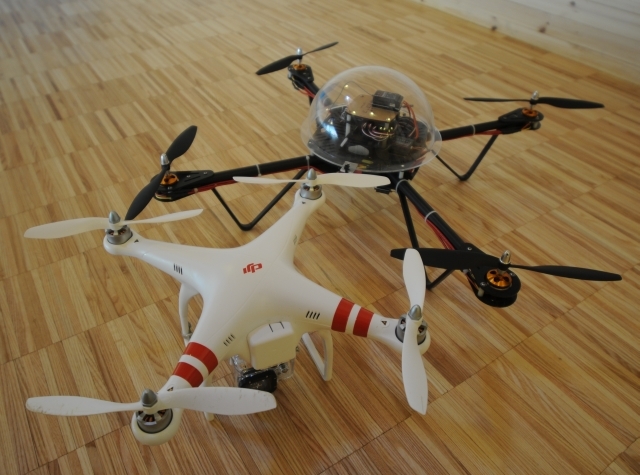 In order to get into the technology, we assembled the ELEV-8 Quadrocopter kit by Parallac inc. Training has been done with a small indoor quad from WL-Toys (V929) prior to tests of the Phantom from Dji Innovations. Our plan is to assemble the DJI Flame Wheel F450 ARF Kit to get the possibility to lift heavier payloads than the GoPro 3. The first flight was conducted from the old airport in Adventdalen, close to the old auroral station on Monday 12th of August 2013. First we calibrated the compass. Then we just launched it in GPS mode. The Phantom feels much easier to fly compared to the V929. The altitude hold works beautifully. At the end of the flight I justed turned off my radio and the Phantom landed itself in front of me! You can download the movie from the GoPro 3 below. The next test was over KHO on 19th of August. The wind conditions was on average 5 m/s and the temperature +7 C. The Phantom was launced from the roof and landed by it self. View flight below. The third test was over UNIS on 18th of September. The wind conditions was on average 4 m/s and the temperature +5.5 C. The Phantom and the F450 were both launced from the roof of UNIS. View flight below. The aim was to get a bird view of UNIS towards East where the third extension will be located.